The DefenCell™ barrier system provides personnel and infrastructure protection in Military, Security and Environmental applications. Lightweight, man portable and non-metallic with a small logistical footprint, it is available in various flexible and modular configurations from individual positions up to complete forward bases and can be deployed rapidly, with or without engineering support. In both military and security applications it affords protection from small arms fire right up to VBIEDs and artillery. In the environmental sphere, DefenCell™'s proven geocell technology makes it ideal for flood protection and ground stablisation. DefenCell™ barrier systems have been supplied to numerous customers including UK, US, Canadian, Italian and Irish forces and various multinational NGOs to provide force protection to military and civil personnel and facilities in a number of demanding operational situations. 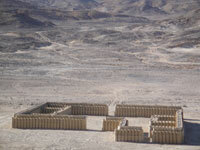 The DefenCell™ Wall System has been developed to enable force protection walls to be built very rapidly in operational conditions. Successive layers of DefenCell™ are built to the desired height. 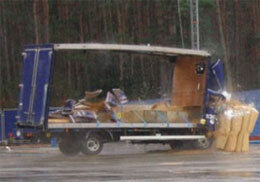 Walls of any thickness or length can be produced to suit ballistic and vehicle impact requirements. The vertical nature of the walls makes them difficult to scale. A wide range of locally available fill materials can be used, including wind blown sand, and easily compacted to give DefenCell™ structural strength and integrity. 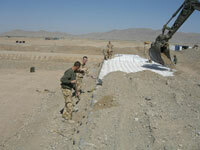 DefenCell™ is made from strong, durable and internationally proven Terram geotextile material; is lightweight, non-metallic, man portable and compact. The outside of the walls are painted to suit local conditions or treated to meet customer requirements. The system offers significant logistical advantages and one 40' container will provide approximately one kilometre of wall, 2.25m wide and 2.10m high, or nearly a mile of 1.35m wide, 2.10m high. The DefenCell™ Traverse System enables traditional traverse structures to be built using locally available soil or sand as a filling material. 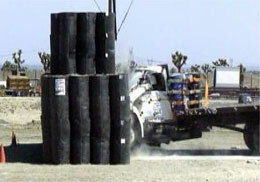 In desert conditions similar to those found in a number of conflict areas, wind-blown or dune sand, generally considered unsuitable for construction, can be successfully used to build traverses up to 5m high and greater. Barriers can be built to provide protection for camps and hospitals, aircraft and helicopter protection, as well ammo and fuel depots. The outside surface of the traverse can be treated on location to blend into its surroundings or enhance its resilience. The traverse and wall systems are versatile and can be combined to provide a vertical wall on one side of the structure, turn corners and accommodate uneven surfaces and obstacles. DefenCell™ is ideal for a wide range of security applications, including vehicle barriers, guardpost protection and checkpoints. It is lightweight and easily installed using locally available fill materials, even with variable or mixed fills to suit different threats. The system is very compact and can be stored and hand carried for rapid deployment in emergency and operational conditions. DefenCell™ is designed to be employed to provide perimeter security in many situations, from enhancing existing security systems and fences, to providing structural integrity to long perimeter barriers. DefenCell™ can be built to virtually any height and profiled to provide protection against specific threats. DefenCell™ uses established geocell technology and can be utilised for a selection of civil and emergency flood protection applications. 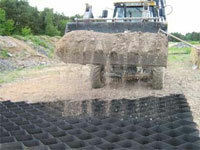 Terram geotextile material drains easily and water will soon filter from wet fill to leave a solid protective barrier. It is fully tested by ERDC, fast and simple to install and remove, lightweight and compact and can reinforce existing flood defences. 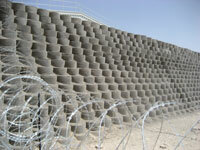 DefenCell™ is very versatile and is ideal for many construction uses. Versions can be used to provide surface stabilisation for roads and pathways, ensuring that supply routes are maintained. In wet or unstable conditions the cell systems are simply deployed, filled and compacted to provide vehicle hardstanding areas. Helicopter landing areas can also be established, with stabilisers added to the fill materials to prevent dust and downdraft erosion.